For this assignment I chose to share Eric Richey’s blog called “Draw Eric!” Most of the work that Eric does and posts to his blog is abstract, cartoon-like sketches that he draws in ink first and then colorizes. I found his work very interesting because a lot of his sketches are really weird and thought-provoking! It seems like each drawing conveys a different mood or feeling. 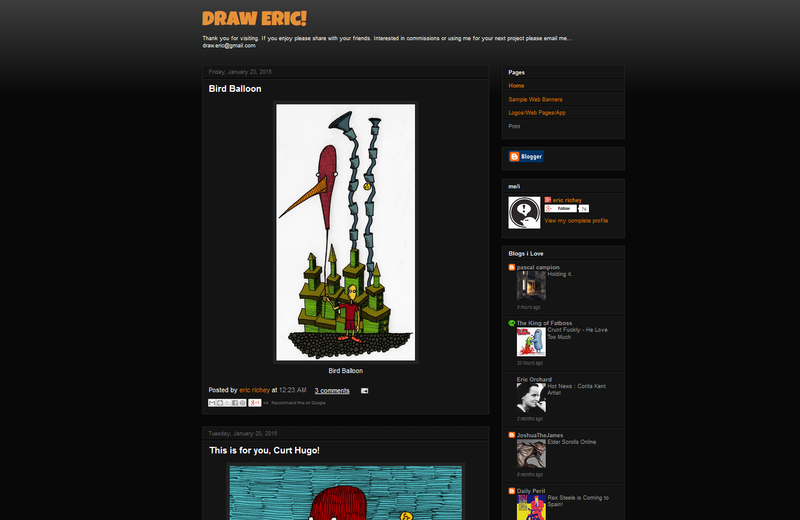 Home page of Eric’s blog. One thing I find cool about his drawings is his shading techniques with using a lot of lines and “cross-hatching” for shading different areas. That is one technique I learned and used quite a bit when I took art in high school. Eric used to work for the Talk Radio Network company during which time he created web banners and logos for various radio talk show hosts. He posts some of the web banners he worked on to his blog also. One of the web banners Eric designed was for Fox News contributor Andrea Tantaros. I found Eric’s blog to be very well put together and easy to navigate. He organizes all of his work and puts all of his sketches on one page and his web-design projects on another. This entry was posted in Uncategorized on January 27, 2015 by brenmac93.